No matter how much you already know, in today’s fast-paced marketing world there’s always plenty more to learn. Today more than ever options for learning new marketing skills abound, and the sheer number of choices can sometimes be overwhelming. Online courses can be an excellent way to advance your career through learning, and offer a go-at-your-own-pace cadence along with the ability to fit in as much or as little instruction as you wish, whenever and wherever you want. With more than 70% of companies seeing online learning as essential to long-term strategy (Digital Marketing Institute), it’s no wonder that online courses are flourishing. 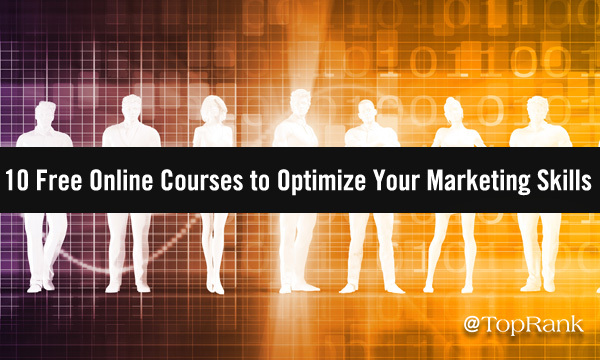 We’ve picked out 10 organizations offering online courses for optimizing your marketing skills, and best of all, each one is either completely free or offers free trials that allow you to try out content before you make a commitment. Stanford, Harvard, Yale, Oxford, Cornell, and many other top universities utilize Stukent for staying current with online courses, and the number of excellent digital and social media marketing-related options is impressive. Additionally, Harvard University itself offers a selection on free online courses, including 14 relating to data science and five in the computer science category. Many marketing professionals use BuzzSumo daily, but with a slew of features few know all the options the platform offers, which is why BuzzSumo created its BuzzSumo Academy program. The program offers a number of courses on how to use BuzzSumo to gather and research information, and you’ll find BuzzSumo Academy here. Operating since 2012, HubSpot Academy offers a strong selection of free online learning resources. Google Analytics is widely used, but with what can be an overwhelming array of features and options, few tap into the true power the measurement platform can provide. Google Analytics Academy aims to change that by getting more people using the advanced featured of the platform, and with numerous free courses available — including “Getting Started with Google Analytics 360” and “Google Analytics for Power Users” — now is the time to dig in and learn more. Traacker’s Academy of Influencer Marketing (AIM) online learning program offers a free course on influencer marketing. “Setting Sail on an Influencer Marketing Program” includes eight videos, five quizzes, 10 texts, and five downloads, all taught by Johns Hopkins University faculty member Shonali Burke. University of St. Thomas instructor Jeff Sauer was an early beta-tester of Google Analytics, and has been teaching marketers how to use Google Ads since 2010. Jeff now offers a free week-long PPC course — an abbreviated version of his more intensive month-long offering, including video lessons, downloads, and extensive preparation help for Google certification testing. Lynda.com offers an impressive selection of digital marketing courses, and with a free one-month trial period, the LinkedIn-owned service can be a goldmine of online learning. With more and 100,000 courses and over 22 million minutes of video, Udemy also offers a wide variety of helpful online courses available during a 30-day subscription trial period. Growing your existing skills and expanding your marketing repertoire with new knowledge are rewarding endeavors whether you’re a chief executive or CMO, or just starting out in the marketing industry. We hope the knowledge you gain from taking any of these 10 online course offerings will help to make your 2019 a landmark year for your campaigns.